This blog post is a continuation of my previous post on Chaos Theory. Although it is not required for you to read that post to understand this post, it would be better if you glance through it once. All of us have heard about the Butterfly Effect. It is one of the very famous examples given in the field of chaos theory. I should also give credit to the movie “The Butterfly Effect” for popularizing this term. So what exactly is butterfly effect? Is it just a theory? Where does it happen in real life? We have now established that in a chaotic system, using the laws of physics to make precise long-term predictions is impossible, even in theory. Making long-term predictions to any degree of precision at all would require giving the initial conditions to infinite precision. At the time of its discovery, the phenomenon of chaotic motion was considered a mathematical oddity. In the decades since then, physicists have come to discover that chaotic behavior is much more widespread, and may even be the norm in the universe. One of the most important discoveries was made in 1963 by the meteorologist Edward Lorenz. He was working on modeling the earth’s weather and he wrote a basic mathematical software program to study it. Lorenz’s code contained the mathematical equations which governed the flow the air currents. Since computer code is truly deterministic, Lorenz expected that by inputing the same initial values, he would get exactly the same result when he ran the program each time. However, Lorenz was surprised to find that when he input what he believed were the same initial values, he got a drastically different result each time. By examining more closely, he realized that he was not actually inputing the same initial values each time, but ones which were slightly different from each other. He did not notice the initial values for each run were different because the difference was incredibly small, so small as to be considered microscopic and insignificant by usual standards. He couldn’t explain this anomalous behavior using the existing mathematical models. 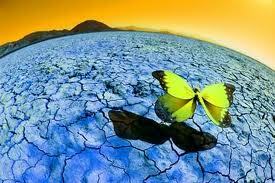 A common example given in the field of chaos theory is that of the Butterfly Effect. It states that, in theory, the flutter of a butterfly’s wings in China could actually affect the weather patterns in New York City, which is thousands of miles away. In other words, it is possible that a very small occurrence can produce unpredictable and sometimes drastic results by triggering a series of increasingly significant events. The mathematics inside Lorenz’s model of atmospheric currents was widely studied in the 1970s. Gradually it came to be known that even the smallest imaginable discrepancy between two sets of initial conditions would always result in a huge discrepancy at later or earlier times. This is the hallmark of a chaotic system. Scientists now believe that like Lorenz’s simple computer model of air currents, the weather as a whole is a chaotic system. This means that in order to make long-term weather forecasts with any degree of accuracy at all, it would be necessary to take an infinite number of measurements. Because the atmosphere is chaotic, these uncertainties, no matter how small, would eventually overwhelm any calculations and defeat the accuracy of the forecast. This principle came to be known as “The Butterfly Effect”. This entry was posted in Computing, Mathematics and tagged Chaos Theory, Distribution, Non-linear, Probability, Random by Prateek Joshi. Bookmark the permalink.